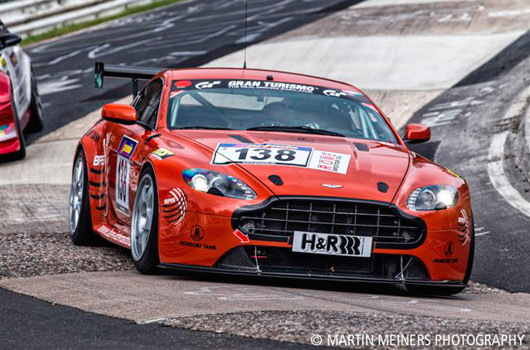 Mal Rose, best known for being a hard working privateer, will be enjoying a factory drive with Aston Martin Racing in the Nürburgring 24 hour race later this month. It’s a great reward for effort for Mal who already has eight N24 races behind him—this year will be his ninth consecutive appearance—as well as many other overseas-based endurance races, including multiple entries in the Dubai 24 hour and Spa 12 hour. Indeed, it is largely thanks Mal’s experience that Aston Martin were keen to sign him. At 49 years of age Mal is pretty chuffed to snag his first ever factory drive. Most of Mal’s racing at the Ring has been at the wheel of a Holden Commodore V8 Supercar. It’s uniqueness and general appeal has earned him many loyal fans in the Eifel and we suspect they won’t be too disappointed to see Rose in action with Aston Martin. He’ll be sharing a 4.7 litre V8 Vantage with fellow Aussie and returning Aston driver Rob Thomson along with Peter Cate (UK) and Jurgen Stumpf (GER). We wish them all the best and are pleased to see Mal is still at the wheel of a thundering V8. That’s no good Ric. Best wishes for a speedy recovery mate. Hopefully Mal has a good showing today, it’s great to see him in the Aston.